Smart Core controls the colour, intensity and location of every light in every individually controlled space or room. A dynamic engine at the heart of the system continuously manages the required lighting settings for each space which are then adjusted by real-time data from sensors or other control commands or third party systems such as BMS. Designed for integration into intelligent buildings, Smart Core an intelligent lighting control system that adds to the capabilities of an intelligent building. The Smart Core SensorBrain is capable of processing and analysing extremely high volumes of sensor data in real time! This makes Smart Core a highly efficient and scalable solution for tomorrow’s intelligent and connected lighting networks. 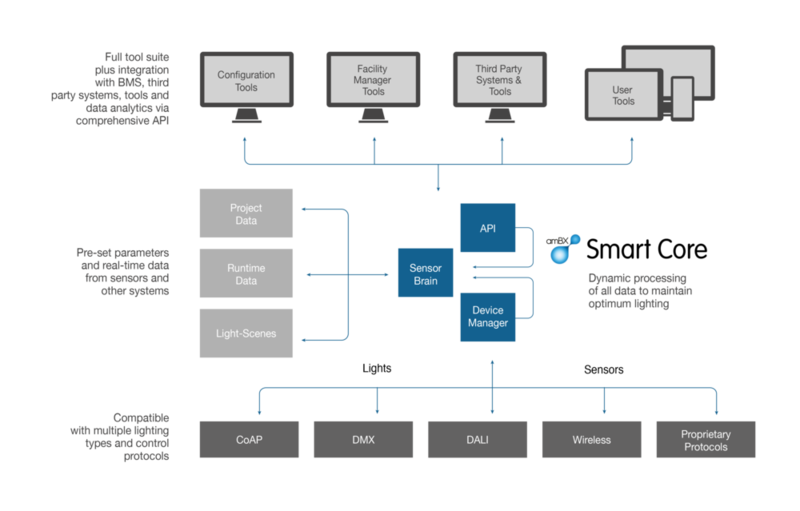 Smart Core includes a separate Device Driver layer allowing connection and control of multiple lighting types – removing the constraints found on many other systems. A range of lighting can be used and controlled within any single space or a mix of existing lighting can be managed alongside new lighting types within a single control system. The flexible design of Smart Core allows rapid integration with lighting protocols including custom versions. The Smart Core API provides deep access to both the functionality of the system and the operating data. This makes it the perfect solution for integrating with building automation systems. Real-time data from sensors can be accessed via the API to support a wide range of data analytics and reporting via 3rd party systems. The Smart Core standard API is a RESTful http interface and a full BACnet API will be released in 2019 for seamless integration with leading building management systems. amBX Smart Core is available as a licensed software system with Smart Core branded application toolsets for Design & Commissioning, Facility Management & End User applications, as well as a white-label solution with tool reference designs. Whether you need a single solution or a new standard of lighting intelligence as part of your proposition, Smart Core is perfectly suited to match your needs. © 2019 amBX UK Limited. All Right Reserved.